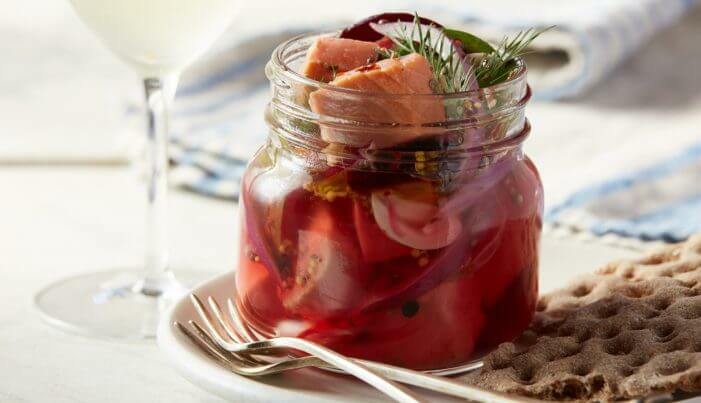 A simple yet delicious appetizer of pickled salmon, onions and beets. A perfect addition to your holiday or anytime party! 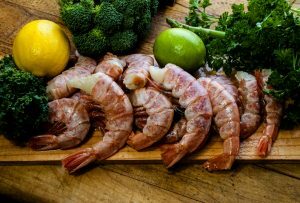 Read the recipe all the way through before beginning. To serve; drain pickling juice from the jar. 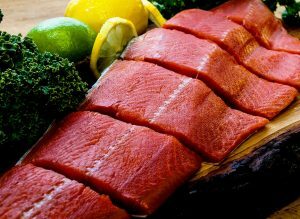 Place salmon pieces in a single layer in a hotel pan and sprinkle evenly with kosher salt. Let sit for 1 hour refrigerated, then rinse with cool water and drain well. Combine vinegar, water, olive oil, spices, garlic, and sugar in a stainless steel saucepan. Bring to a simmer then remove from heat and let cool. Refrigerate until ready to assemble jars. In a large saucepan bring 2 quarts of water to a simmer. Add salmon and cook for 1 to 1½ minutes or until just barely cooked. 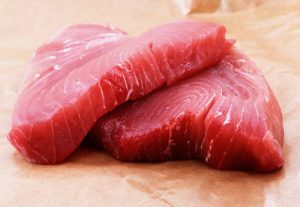 With a slotted spoon remove salmon from poaching liquid and cool in refrigerator. 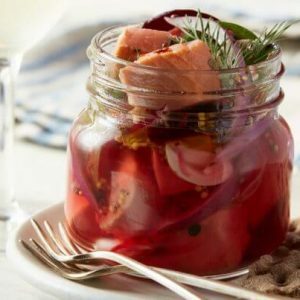 Line up jars and evenly divide ingredients into them in the following order: half the salmon; 3 to 4 fluid ounces pickling liquid with some of the spices; red onions; beets; jalapeño rings; remaining half of the salmon cubes; and dill. Top off with remaining pickling liquid to cover salmon. 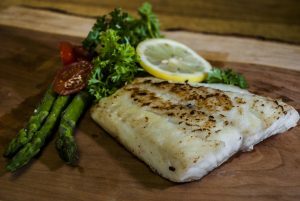 Close lids tightly and refrigerate jars on a sheet pan for a minimum of 48 hours before serving. Label and date sheet tray. Pickled salmon will keep, refrigerated, for up to 1 week. Note: This is not a preserving method; the jar is for presentation only and this must be considered a fresh-pickled item.